I’ve been waiting to take photos of these two garment since just after new Year, in the desperate hope that I’d be able to get photos of them outside in the sun somewhere, but life kept conspiring against me. Picnics were rained off, or I was unable to attend, or it was too cold to wear shorts…eventually I decided to just photograph them in my sewing room as usual! Of course, once I did that the rest of the day was stunningly sunny, so I could have got my outdoor shots if I had been willing to bribe someone to take the photos, but never mind! You’ll just have to use your imaginations. When I went back and looked at the photos from that post, I thought that probably the problem was not enough length in the crotch curve in the bum of my original shorts. I laid the back piece of the maritime shorts over the back piece of the Ralph Pink Panthea Shorts (because although I think there are some serious issues with that pattern, those shorts fit my bum well). The crotch curve was definitely longer on the Panthea shorts, so I traced it off, blending into the original Maritime curve about half way up. That’s the original underneath, with my modified version sitting on top. It’s such a tiny difference, but it really has made a huge difference to the fit and comfort of the shorts. I also added an inch to the hem of my traced version, and them added another two inches to the hem when I was cutting out, as I remembered how short my other pair is! The other major modification I made to the shorts was to remove the fly front, and put an invisible zip in the side seam. This is a modification which I shamelessly stole from Sarah over at Fabric Tragic, and it’s such a good idea! Not only does it remove the hassle of sewing a fly (I know, I know, it isn’t that hard, but it can be a fiddle), but it gives a nice smooth front which I think I prefer in shorts, especially when I’m wearing looser tops. It was easy enough to do, I just sewed straight up the front crotch, and cut the waistband on the fold (at the CF mark instead of the edge of the pattern piece, otherwise it’ll be too long!). Then it was as easy as sewing the invisible zip in the side seam, all the way up though the waistband. I dont really have anything new to say about the Ogden Cami, I love all of my versions! this one is made up exactly the same as my other ones, but this time I used some linen from The Fabric Store rather than soft drapey rayon. I like the different silhouette that the crisper linen gives the camisole, and it’s nice in the heat to not have something that sits against my skin. I love the colour, I was really happy when I realised that it was the same colour as the seed pods on the C+S fabric. I also have some of the same linen in pale pink, I think I might make it into a shirt dress, if I don’t run out of summer! If you do something three years in a row that makes it tradition right? This is the third year in a row that I’ve started the year with a post showcasing a new pair of shorts and a summer top, so I’m going to say it’s now traditional! My first year was a Grainline summer outfit, last year was my weirdly constructed Panthea shorts and an Emmeline tee, and this year it’s a True Bias party. I’ve already posted about the Ogden Camisole, so I won’t talk about that too much. This one is also rayon, a lovely rayon crepe which I bought from Tessuti in Melbourne when I was there in November. 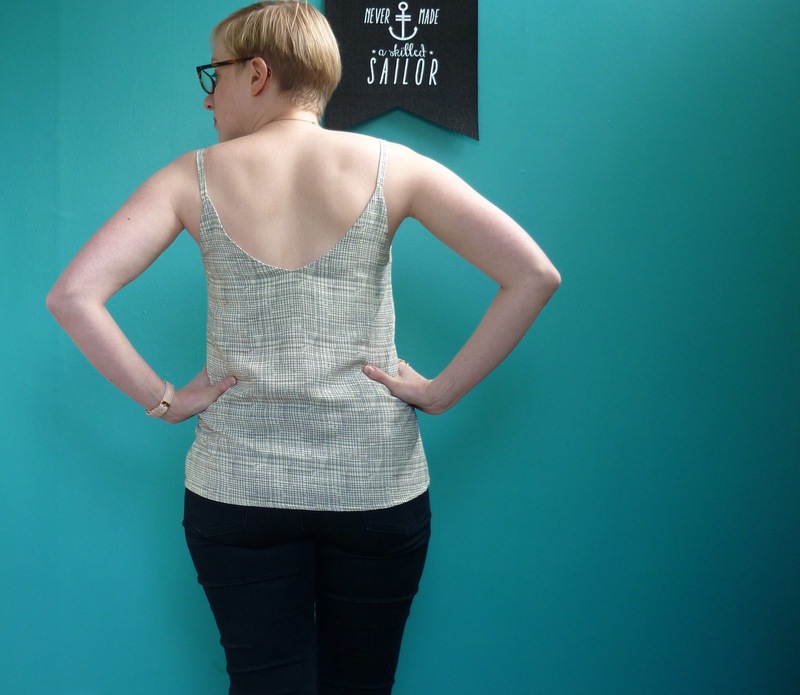 I find rayon crepe can be so variable, I’ve worked with some which is really drapey but loosely woven and which seems to grow as you work with it (or wear it, alarmingly), and also some which has been stiff and scratchy (but which holds it’s shape). happily, this stuff has the best qualities of all of the rayon crepes I’ve used, it’s smooth and drapey but hasn’t sagged out. Even still, I was careful to stay stitch everything, and tried not to handle the pieces too much until they were sewn together! I really love this top, I’ve worn it lots since I finished it at the end of December. It was a good thing to wear to casual festive parties. I’ve also made the True Bias Emerson Shorts! I’ll say straight away that I really like these shorts. The elastic back waistband means they are really comfortable, but the flat front waistband stops them looking too casual. I like the slash pockets and the front pleats too, and they were a really quick sew. What more could I want in a pair of shorts? I could maybe want a less crush-able fabric. I made these with the remnants of linen from my McCalls shirtdress, so they’re really cool and soft to wear, but man do they crease! I ironed these just before putting them on, but I made the mistake of sitting down to put my shoes on, and this is the result. Oh well, linen! I’m happy with the fit, though looking at this picture I can see that there are drag lines towards the inseams. I don’t know if I need more room for my bum, or if I’m just standing a bit funny! I’m not too worried about them for basic shorts, but if I make them again I might have a fiddle with the crotch depth. I do like the length and the width of the leg, I think they’re quite flattering! These are a really quick sew, they only took me a few hours one afternoon to put together. Actually, both pieces are really quick projects, nice and easy for the slow days between Christmas and New Year! I really like how the cami looks knotted (this is me ripping off the outfit from the True Bias sample photos…), but I find that there isn’t quite enough fabric around my hips to get a decent knot that doesn’t just fall out. I might have a play with some future versions, I could either grade it up a few sizes towards the hem, or I might try adding some cut-on ties to the hem. There are so many things I want to do with this pattern, expect to see a few more before the summer is done! Ugh, this week. I’m very glad it’s over! Last Sunday evening the hard drive on my laptop gave up completely as I was trying to back it up (oh the irony). Normally the loss of my laptop wouldn’t be the end of the world (I don’t use it too much), but my final assignment for trimester two is due tomorrow, and I had everything I had written and all my research on it. Thank god the partner of one of my friends is an IT guy, and he managed to retrieve my info off the hard drive before it completely crapped out, so I managed to get it all done (though I still need to edit about 500 words out of it, bit of a pain…). I’ve also been struck down with my usual spring hay fever (thanks pine trees, you dicks! ), so I feel like a bit of a snivveling mess. But now that my paper is written and I’ve bought myself every antihistamine on the market things should be looking up, and I have some new sewing projects which I’m really happy with to share. 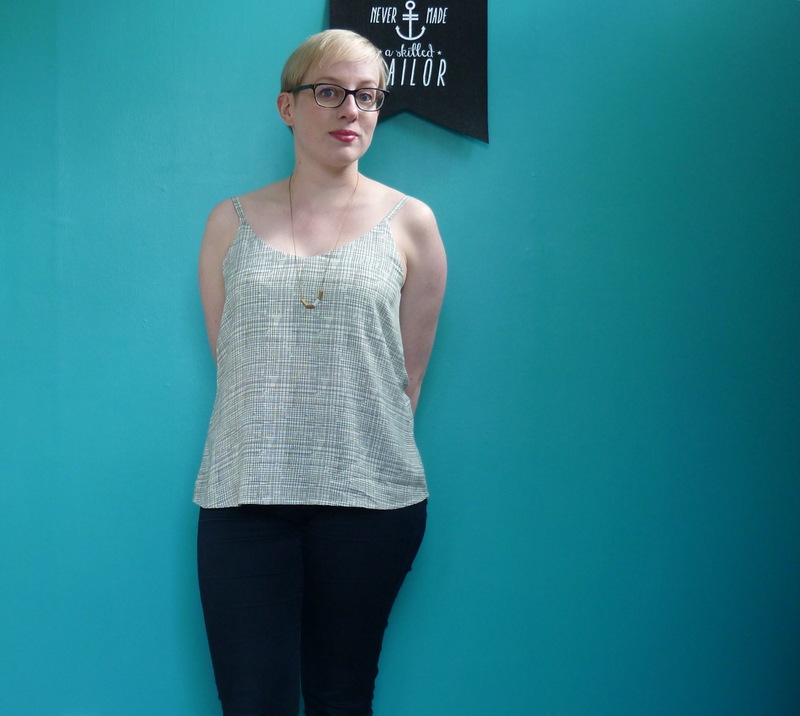 First up is my first True Bias Ogden Cami, in a lovely rayon from The Fabric Warehouse. I’m really going to have to get over my hatred of strapless bras, because I really like this top and have several lengths of fabric earmarked for more! It was such a quick satisfying project, I was able to easily get it out of the metre of fabric I had and it probably only took two hours from cutting to finishing. I took the advice of the instructions and added a ribbon to the back facing so that I can tell the front from the back, which was a good call. I love the facing, it gives such a lovely smooth finish at the neckline, and the double layer of fabric means that it sits really smoothly over my bra and a coloured bra won’t show through. I wore this for a night out dancing the same day that I made it, and it was very comfortable in the heat! Unfortunately I clipped the seams around the straps a bit severely, and the next morning I realised that one of the back straps had partially pulled out of the seam. It was an easy enough fix, and I went around and reinforced the rest of the strap attachment points too. Next time I’ll leave a bit more length in the seam! 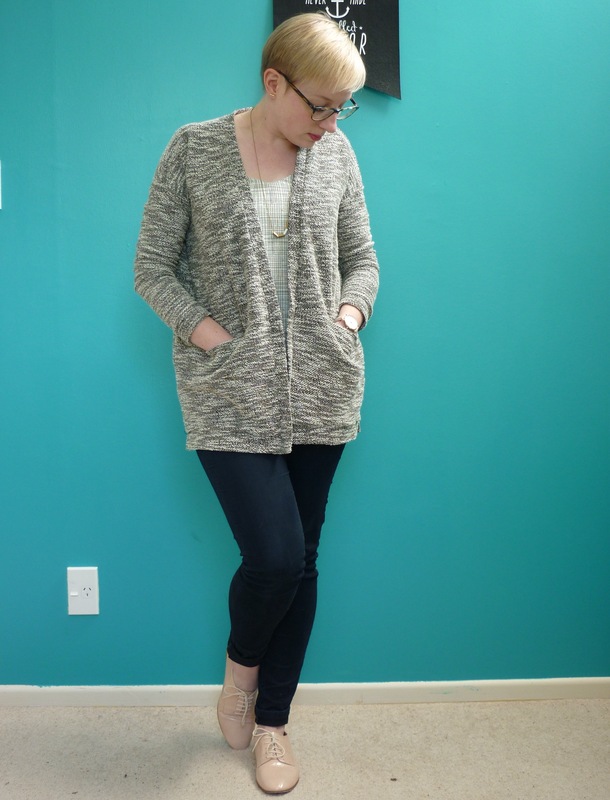 Next up is my Grainline Driftless Cardigan. 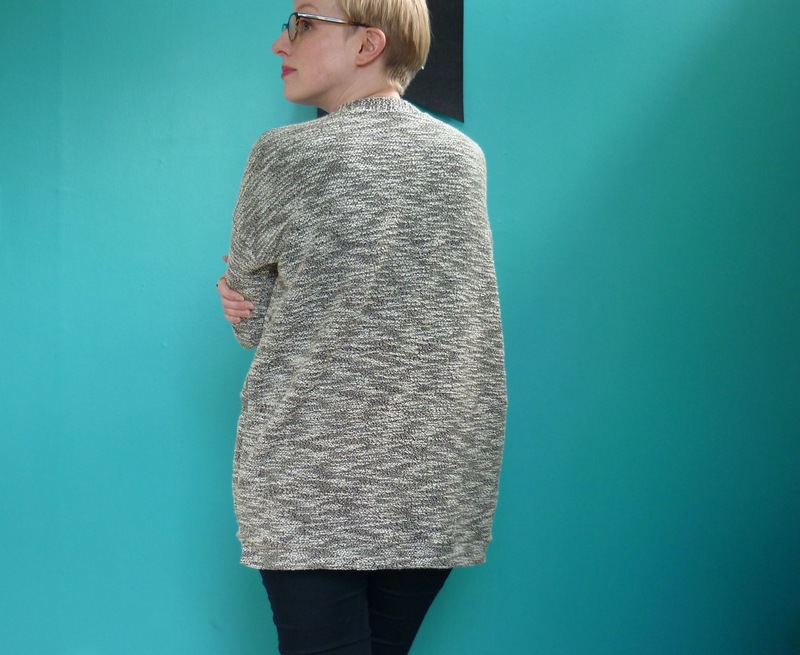 This is actually the second Driftless Cardigan I’ve made, though the first one never made it to the blog (I made it out of a beige wool sweatshirting, which is lovely and warm and got worn a lot over winter, but it has pilled horribly and definitely looks like a house-only garment). This one is a cotton/poly blend from the remnant bin at The Fabric Store, and it has an amazing bobbly bouclé texture. I had only just enough fabric to squeeze this out, though I did have to piece the neckband. The texture of the fabric means the join is invisible though, I can only find it by feeling for the extra thickness of the seam. I really wanted to use the high/low hem bands from view B, but due to the aforementioned fabric shortage I could only manage the standard hem band. To compensate, I followed the split hem instructions anyway, and I like the result just as much! 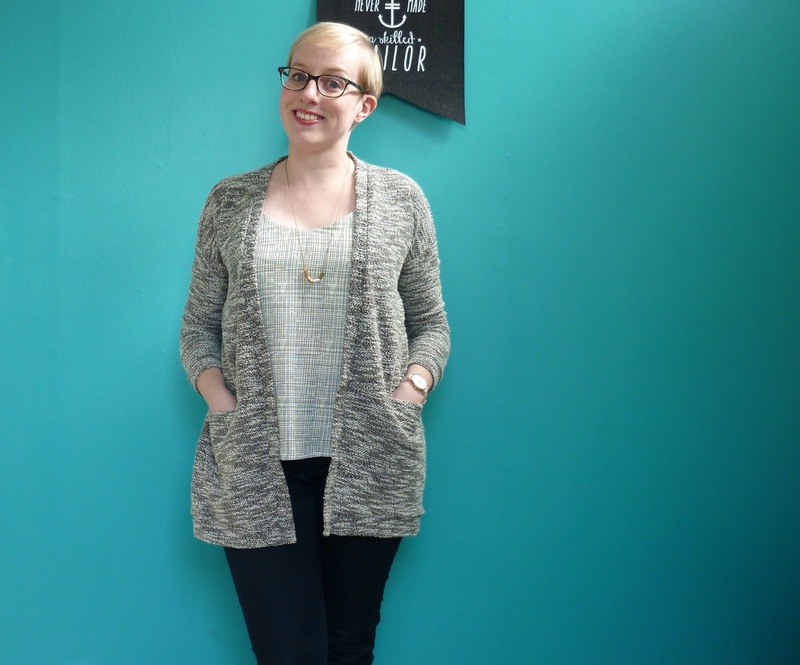 I do like the cocoon shape of the cardigan! 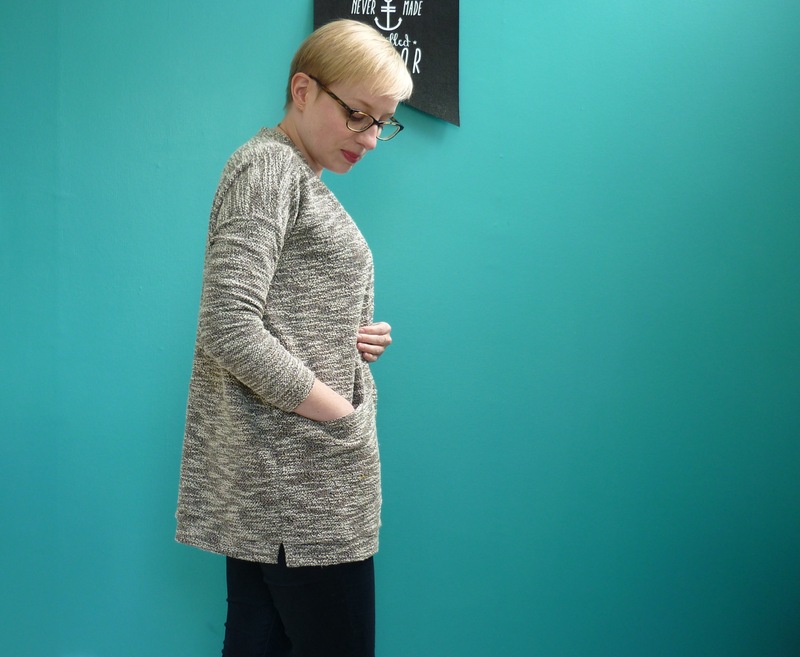 I also like the way the slim sleeves balance out the volume in the body, making it look oversized but not like I’m wearing someone else’s much bigger cardi. I overlocked the whole thing, even the neckband (the instructions say to hand stitch or topstitch the neckband over to give a neater finish), which seems to be staying in plave after a good steam. I’ve been wearing it so much, its the perfect weight for this time of year. Unfortunately I realised this morning that I’d managed to get something yellow on it, I suspect it might be a bit of curry paste from dinner last night! So its soaking down in the laundry, and I’m desperately hoping that it’ll come out. Otherwise I might have to get a black felt pen out to disguise the worst of the yellow! Hi, I’m Kirsten. 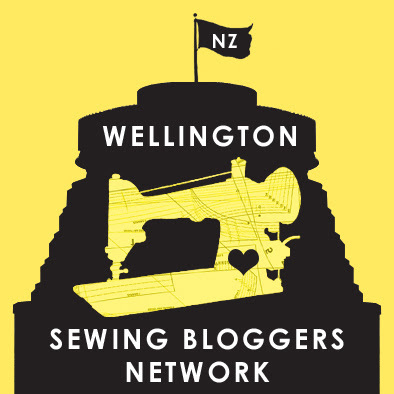 I live in beautiful Wellington, New Zealand, and I seem to spend most of my time planning sewing projects, daydreaming about fabric and sewing up a storm. This is where I show off the results!